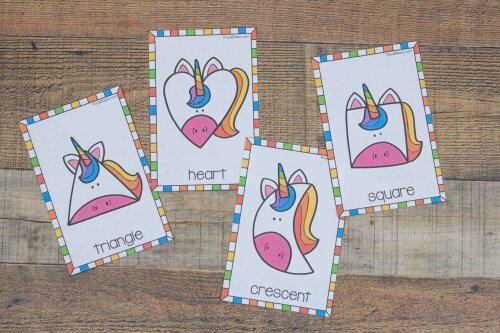 Unicorns are magical and the best way to learn about shapes! Rainbow unicorns are even better. And hands-on shape practice cannot be beat. 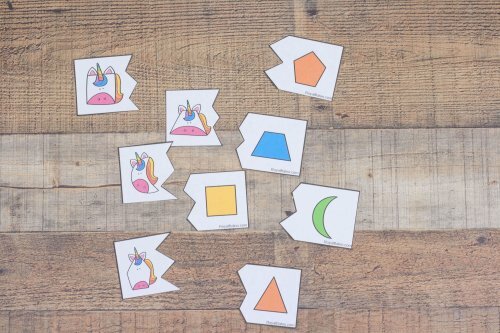 Shapes are one of the earliest topics we introduce to kids and for good reason! 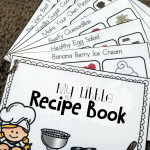 They’re not only a precursor to math skills but also to reading skills. Being able to differentiate between different shapes is similar to identifying different letters. 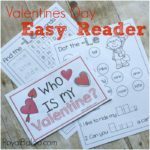 Helping kids practice these skills is an excellent way to set them up for reading success. Unicorns are some of the best magical creatures – if only because they’re rarely, if ever, scary. I’m all about magical creatures, but sometimes they’re depicted in downright scary ways. 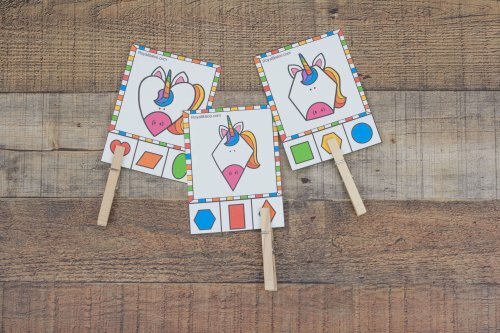 But really, the unicorn theme is great because kids are really into unicorns right now. There’s something about that magical creature that is super trendy. And I’m all about hopping on trends if it gets my kids excited. What’s in the Shape Set? There are 5 activities included in the set. These would be great to hang up, trace with a finger, or use a manipulative to make the shape on top. 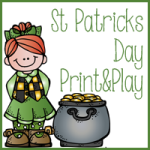 We often use playdough for these kinds of cards. But Cheerios, or other small cereal, would be great. You could use LEGO blocks, small counters, mini erasers, or a multitude of other small things. I love clip cards for practice! And these ones are extra colorful which is just fun. 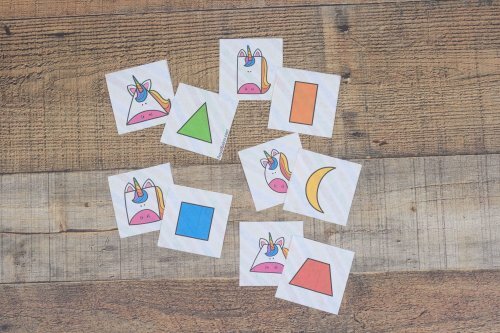 There is a card for each shape. I love using clip cards with clothespins. 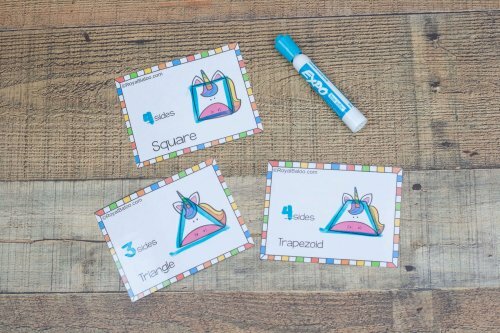 But there’s no reason you cannot use them with dry erase markers or something you can place on the right answer, like cereal or mini erasers. 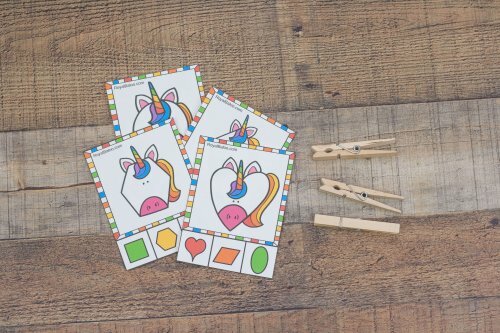 These puzzles are all 2 piece puzzles where you match the shape with the unicorn head shape. There is one 2 piece puzzle for each shape. 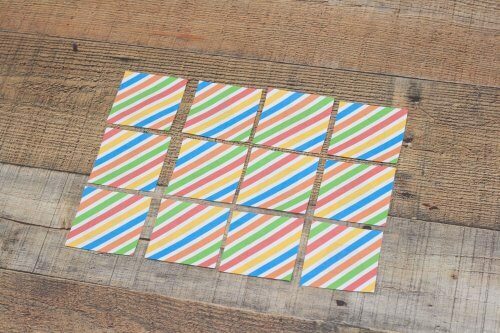 If you laminate these cards or put them in a sheet protector, they’re great to use with dry erase markers! Trace the shape and count the sides. But if you’d rather not use them as dry erase cards, that’s fine too! 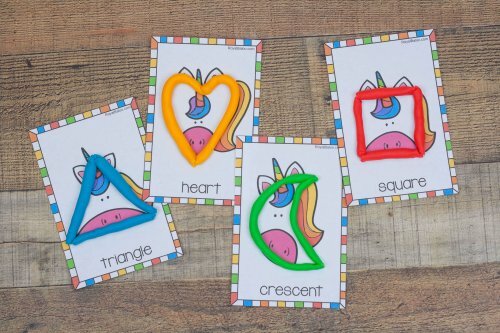 You can trace with a finger, colored pencil, crayon, or use a small manipulative to make the shape! Last we have the shape matching game. These can be printed double sided so you cannot see through the paper. Although, printing on cardstock would still be a good idea! 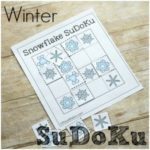 Just like a traditional memory game, flip all of the pieces over. Each player takes their turn flipping over two pieces. 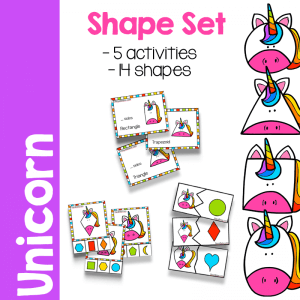 If you’ve matched the shape and the unicorn shape, you get to keep the pieces! If not, flip the pieces over again and it’s the next person’s turn.